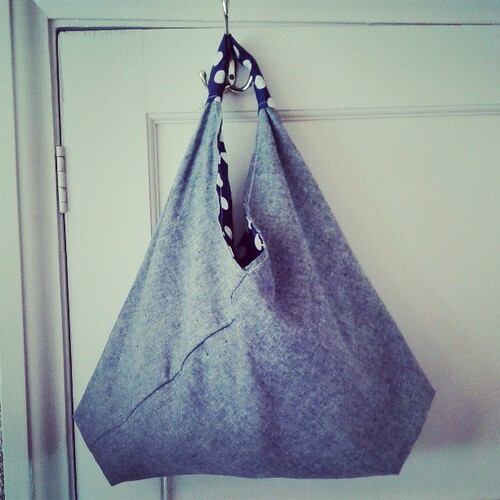 Whilst I should have been finishing of my sewing kits for the Fat Quarterly Retreat swap, I got a little distracted, and accidentally made this bag, whoops! In my defence, it was Karen at Blueberry Park's fault. She showed a photo of some of her bag collection, and one particular bag caught my eye, so I asked the obvious question, what pattern is this bag from, and she kindly pointed me in the direction of the Origami Market Bag, on the fantastic Whip-up website, pattern written by Alexandra Smith. Not only is it a fantastically simple and quick bag, it's also free, can't say fairer than that! I did deviate from the pattern a little, instead of using the guideline 130cm of fabric for the length, I used 115cm, as it was the width of fabric, and reduced down the size of the width accordingly. I made a second bag, and used it as a lining (the £2 a yard polka dot I bought at the Fabric Guild a few weeks back), as the Essex Yarn Dyed in Black I used for the outside fabric wasn't quite heavy enough for the bag. I sewed the bag and lining together around the opening, and so it's reversible. The other main difference being the extension of the handle with another piece of fabric, and extending the length of the tube that covered it- this was to account for the reduced dimensions of the original fabric, which made the handle length smaller, so it could still be used as a shoulder bag. I would definitely make one of these again, and would line it again. The question is though, would I make any other changes? Yes, I would probably make the slightly bigger version, and most importantly, put pockets on the inside, to help me store all of the junk I seem to carry with me. Very cool bag and I love the sewing kits! 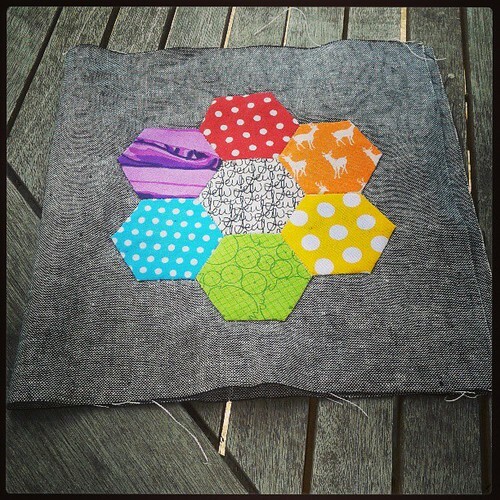 Lovely bag and great hexies. Gorgeous, gorgeous bag! Might have to have a go at this one! oooh, funky bag. I blame Karen too.